Before about 2012, these three things didn't have much in common. However, planning for the World Cup 2014 in Brazil is in full swing, and competitions are springing up everywhere. From increased emphasis on English and tourism, new jobs, infrastructure, traffic and international attention--Brazil is a hot spot, and everybody wants a piece. To me, one of the most interesting cases in this process concerns a forming alliance between Coca-Cola and the Bahianas of acarjé, while Fifa alienates the Bahianas from reaping the benefits of the major tourist influx and foreign investment in preparation for the World Cup. First, I will comment on the alliance between Coca-Cola and Acarajé. The Brazilian sector of the Coca-Cola Company has a huge presence in Brazil (as I assume many other countries in the world outside of the U.S.). They have strategically started forming relationships with the women who make the iconic cultural food of Bahia -- acarajé. Acarajé is considered the most unique food of Bahia - the ingredients and recipe come from an African ancestry-- some even associate the food with the Yoruban goddess Iansã. The women, "Bahianas of acarajé", sit on almost every main plaza or street corner in Bahia, selling their home-made acarajé for a very reasonable R$5. These women generally come from candomblé terreiros in peripheral communities, or learned how to make the food from family members associated with the religion. A recent study showed that "vender of acarajé" is the most common occupation amongst candomblé women in Salvador (Mapeamento dos Terreiros de Salvador, 2009). I have quite a commute to arrive at my classes at the Center of Afro-Oriental Studies, UFBA in downtown Salvador. Along the way I see a broad array of billboards for products and happenings in the city. I also pass right by the new Nova Fonte Arena Stadium, which has been in construction for about 2 years. It is set to be completed by the end of March, to host the Confederation Cup 2013 before the main event, the 2014 World Cup. A few weeks ago on my commute I saw the following billboard and was very taken aback. I was particularly struck by this image because a big part of my research has to do with the representation of Bahianas in the media and how they are employed in the "patrimonialization" of Afro-Brazilian Culture. This advertisement says it all. The ad calls acarajé the "imaterial patrimony of Bahian culture" and at the bottom in smaller print it says "preserve this culture". I almost laugh at the implications of this last statement. It makes you wonder, do we need Coca-Cola to "preserve" a culture? Does slapping the Coca-Cola stamp on a cultural item like acarajé give it more importance, because of a certain visibility and capitalist privilege? Or, does this appropriation of Bahianas of acarajé change the very face of this cultural expression; does it alter it's value and purpose entirely? These questions intrigue me, and I find the whole situation very indicative of the use of Afro-Brazilian culture for tourism and international interests (a critique that is even attributed to Landes' international representation of candomblé women in 1938 as matriarchal fetish priestesses). While Coca-Cola is happily holding hands with the "National Association of Bahianas of Acarajé", the partnership between McDonalds and FIFA is crushing the Bahiana venders and prohibiting them from selling their traditional food within 2 kilometers of the World Cup stadium (Bahia Notícias, 10/4/2012). 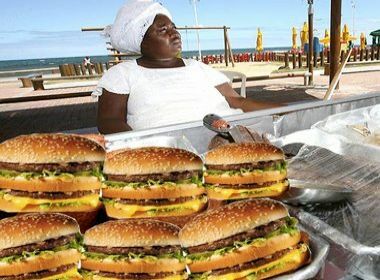 As the official sponsor of the 2014 FIFA World Cup, McDonalds must secure a monopoly on food sales in and around the stadium to profit sufficiently from their contributions. Also an official sponsor of the World Cup, Coca-Cola can happily support Bahianas, because Bahianas don't make their own sodas or refreshments to complement the food they sell. And trust me, in the hot muggy climate of Bahia, a cool refreshing beverage is essential while eating a hot acarajé rice cake. A Coke fits in perfectly to the mix. I even saw an official "Coca Cola Acarajé" stand at Carnaval in Salvador. They had a special price for an acarajé and a coke together-- it's a perfect combination! The National Association of Bahianas of Acarajé and their president, Rita Maria Ventura dos Santos, are continuing to fight for their space in the World Cup. Questions of sanitation, tourists preferences and safety codes are prohibiting Bahianas from competing with the behemoth of FIFA and McDonalds. Everybody wants a piece of the foreign investment and a rare opportunity to make extra bucks during this heightened season for Brazil. As a tourist, I sure as hell wouldn't travel all the way to Bahia to eat McDonalds in a stadium and watch a soccer game within a structure that could be replicated anywhere in the world. Why did FIFA choose Brazil in the first place? Isn't it the samba, the parties, and the colorful vibrance of the national culture? (Their slogan for Brazil after all is "all in one rhythm"). Well it doesn't take much to recognize that those elements are fundamentally related to the immense Afro-Brazilian presence throughout the history of Brazil. Erasing the Bahianas presence within 2 kilometers of the stadium just reinforces a socio-economic divide so characteristic of race relations and foreign relations in Brazil. It's disgusting. Almost as disgusting as paying 7 dollars (R$14) for an imported Big Mac. Jocélio Teles dos Santos, Mapeamento dos Terreiros de Salvador. UFBA Editora, 2009.